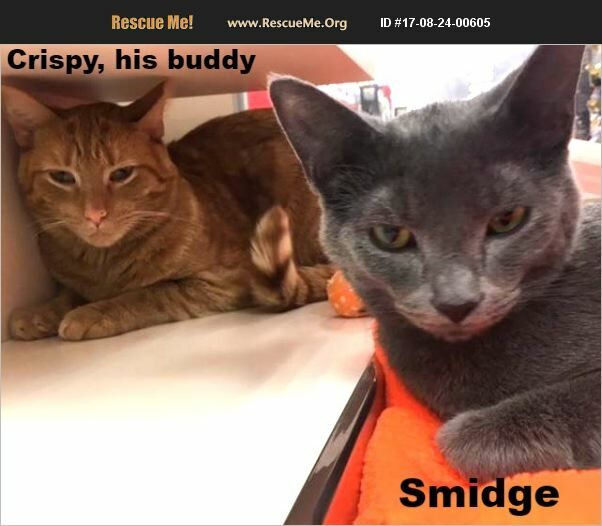 Smidge was born in April 2017 and taken into foster care with his 3 siblings. He has grown from a shy scaredy cat to a handsome little boy that asks for pets and rolls over for belly rubs. He would be a GREAT little brother to an adult cat that wouldn't mind him rubbing up against them or chasing their tail a bit. He has good manners and backs off when told. He is neutered, fully vaccinated and so darn sweet in asking for attention. He gets his motor going easily. See his video with his 'Uncle' Krispy.